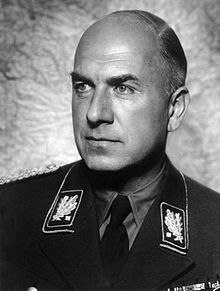 Fritz Todt (4 September 1891 – 8 February 1942) was a German construction engineer, senior Nazi, who rose from "Inspector General for German Roadways" where he directed the construction of German Autobahnen (Reichsautobahnen) to Reich Minister for Armaments and Ammunition where he directed the entire war military economy. At the beginning of World War II he initiated what Hitler named Organisation Todt, a military engineering company which supplied industry with forced labor and administered all constructions of concentration camps in the late phase of the Third Reich. He died in a mysterious airplane crash in 1942. Todt was born in Pforzheim in the Grand Duchy of Baden, today's Baden-Württemberg to Emil Todt (1861–1909) and his wife Elise née Unterecker (1869–1935). His father owned a small ring factory. During 1910, he volunteered for one-year military service. From 1911 to 1914, Todt studied engineering at Technical University of Munich and at Karlsruhe Institute of Technology, graduating with a Diplom degree in construction engineering from the latter. During World War I, he served initially with the infantry and then as front line reconnaissance observer within the Luftstreitkräfte (the German Air Forces – DLSK), winning the Iron Cross. After the war he resumed his studies, graduating during 1920. During 1921 he initially worked on waterpower stations for the Grün & Bilfinger AG, Mannheim company and, later during 1921, the civil engineering company Sager & Woerner [de] and worked there until 1933. On 5 January 1922, he joined the Nationalsozialistische Deutsche Arbeiterpartei (NSDAP), or "Nazi Party". During 1931, he became an Oberführer (senior Colonel) in the Sturmabteilung (SA), which was then commanded by Ernst Röhm. During 1932, Todt completed his thesis at Technical University of Munich "Fehlerquellen beim Bau von Landstraßendecken aus Teer und Asphalt" – "Sources of defects in the construction of tarmac and asphalt road surfaces" and became a Dr.-Ing..
Rudolf Hess, Heinrich Himmler, Philipp Bouhler, Reich Minister Todt and Reinhard Heydrich (from left), listening to Konrad Meyer at a Generalplan Ost exhibition, 20 March 1941. During July 1933, five months after Hitler became Reichskanzler, Todt was appointed "Inspector General for German Roadways" (Generalinspektor für das deutsche Straßenwesen). This public authority (Oberste Reichsbehörde) was privileged to be outside the hierarchy of Reich Ministeries, and Todt was subordinated directly to Hitler. Alan S. Milward characterized this phase as follows: "His personal views on business questions and, what was more important, the success of the motorway project kept Todt in the inner circle of the Führer. At the same time, his deliberate pose as a technical expert, as a man without interest in internal power struggles, saved him from the adversaries of the more important party leaders for long time. ":44 He was given the task of organizing a new construction company for the motorways (Reichsautobahnen). He edited the journal Die Strasse, which was a publication of his agency from 1934 - 1942. For his work on the autobahnen, Todt was recognized with the German National Prize for Art and Science by Hitler, next to Ernst Heinkel, Ferdinand Porsche and Willy Messerschmitt. Hitler donated the award during 1937, devised as a replacement for the Nobel Prize, which Hitler forbade Germans from accepting starting during 1936. During 1938, he became Leiter des Hauptamts für Technik in der Reichsleitung der NSDAP ("Director of the Head Office for Engineering in the National Directorate of the NSDAP") and during December Generalbevollmächtigter für die Regelung der Bauwirtschaft ("General Commissioner for the Regulation of the Construction Industry") At the beginning of WWII he was also appointed to the rank of Generalmajor of the Luftwaffe. 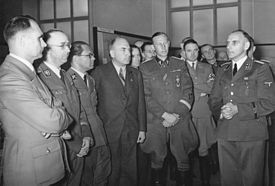 During May 1938, he initiated the Organisation Todt (OT), joining together government firms, private companies and the Reichsarbeitsdienst (Reich Labour Service). OT used up to 800,000 forced laborers (Zwangsarbeiter) from countries Germany occupied during World War II. Todt was responsible for the construction of the "West Wall" (commonly named the "Siegfried Line" in English-speaking countries) to defend the Reich territory. On 17 March 1940, Todt was appointed Reichsminister für Bewaffnung und Munition ("Minister for Armaments and Munitions") which meant he managed the entire military economy. After the invasion of the USSR during June 1941, Todt was appointed to manage the restoration of the infrastructure there. At the end of July 1941 he was named Inspector General for water and energy. During that year, he became increasingly distant from the commanders of the Wehrmacht and in particular, from Reichsmarschall Hermann Göring, the Oberbefehlshaber der Luftwaffe (Commander-in-chief of the Luftwaffe). After an inspection tour of the Eastern Front, Todt complained to Hitler that without better equipment and supplies for the armed forces it would be better to end the war with the USSR. Hitler rejected such an assessment and continued the offensive against the Soviets regardless. Todt was married and had 3 daughters and one son. On September 4, 1941, the occasion of his 50th birthday, he founded the Dr. Fritz Todt Foundation, the goal of which was to promote young talents of technicians, especially young people from poor families by a training subsidy. On 8 February 1942, soon after takeoff from the Wolfsschanze ("Wolf's Lair") airfield near Rastenburg in East Prussia, Todt's aircraft crashed. He was buried in the Invalids' Cemetery in the Scharnhorst-Strasse in Berlin. Posthumously he became the first receiver of the newly created Deutscher Orden ("German Order") the most important award that the Nazi Party could bestow on a person for "duties of the highest order to the state and party". On 8 February 1944, the second anniversary of Todt's death, Hitler awarded the Dr.-Fritz-Todt-Preis as a Badge of Honor of the Nazi Party for "Innovative accomplishments, which are of great importance for the Volk community because of the improvement of their weapons, ammunition and military equipment, and the saving of labor, raw materials and energy". The Badge of Honor came with a material prize and a certificate, was awarded as a medal made of gold, silver, or steel. 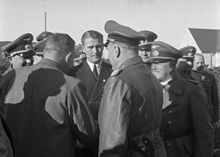 The Golden Award of Honor was presented by Hitler in person upon proposal by the responsible Gauleiter, upon the joint proposal of Robert Ley, the director of the corresponding Deutsche Arbeitsfront and NSDAP leaders, and the director of the "Main office for Technology in the NSDAP", Albert Speer. Wikimedia Commons has media related to Fritz Todt. ^ Alan S. Milward: Fritz Todt als Minister für Bewaffnung und Munition. In: Vierteljahrshefte für Zeitgeschichte [de] 14, 1966, Heft 1, p. 40–58). ^ Stephenson, Charles (2006). The Channel Islands 1941–45: Hitler's Impregnable Fortress. Osprey Publishing. p. 16. ISBN 978-1-84176-921-9. ^ Albert Speer's autobiography: Erinnerungen. Ullstein, Berlin 1969, ISBN 3-549-07184-1. ^ Todt, Fritz ww2awards.com, STIWOT, n.d. accessed 14 July 2017. ^ Der deutsche Baumeister 12/1939. ^ Peter Koblank.Best of Koblank Die Göring-Speer-Verordnung. Arbeitnehmererfindungsrecht im Dritten Reich / Dr.-Fritz-Todt-Preis. EUREKA impulse 12/2012, p. 2. Overy, Richard J. (1988). "Mobilization for Total War in Germany 1939-1941."". English Historical Review: 613–639. JSTOR 572694. Busch, Andreas: Die Geschichte des Autobahnbaus in Deutschland bis 1945. Rockstuhl, Bad Langensalza 2002, ISBN 3-936030-40-5. Schönleben, Eduard [de]: Fritz Todt, der Mensch, der Ingenieur, der Nationalsozialist. Ein Bericht über Leben und Werk. Gerhard Stalling, Oldenburg 1943. Schütz, Erhard [de], Eckhard Gruber: Mythos Reichsautobahn. 2. Auflage. Links, Berlin 2000, ISBN 3-86153-117-8. Franz W. Seidler: Fritz Todt. Baumeister des Dritten Reiches. Ullstein, Frankfurt am Main/Berlin 1988, ISBN 3-548-33095-9.419 pp. Adam Tooze: Ökonomie der Zerstörung. Die Geschichte der Wirtschaft im Nationalsozialismus. Siedler, München 2006 (German 2007), ISBN 978-3-88680-857-1. New edition: Schriftenreihe der Bundeszentrale für politische Bildung, vol. 663, ISBN 978-3-89331-822-3. Wieder: Pantheon, München 2008, ISBN 978-3-570-55056-4. Tribute to Fritz Todt. Story RG-60.3910, Film ID: 2691. Deutsche Wochenschau, February 1942 (in German). Duration 8:35 min. Steven Spielberg Film and Video Archive, USHMM. Funeral of Fritz Todt at 01:05:12.